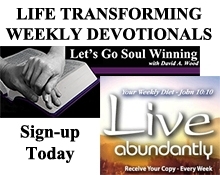 Click on the links below to view past copies of Live Abundantly or complete the form to receive a copy of Live Abundantly emailed to you every Monday. Also receive a copy of Let's Go Soul Winning emailed every Wednesday. God Will Provide - But When? How? And You Can - Take It To The Bank! Missing Someone In Your Life? Have You - "Stepped Across The Line"? Never Lonely - Never Forsaken What A Shepherd!!! A Life Of Blessing; If ----"
The Most Valuable Thing I Have Today Is --? Issue....The Power Of The Right "Song"
Where is God's House? Where Does He Live? Is There Deliverance "From" or "In" Our Trouble? You Can Set the "Temperature"
Something Worth More Than $86,400?? Don't ever - Ever - EVer - EVEr - EVER Quit! The Power of "MY" Attitude"
The Missing Ingredient of "Passion"
A Word About Angels - "Real Angels"
"The Devil Made Me Do It" - REALLY? "Focusing" - The Believer's Advantage? How Can I -- "Pray without ceasing"?? There's A Great Day Coming!!!! Think With My "Eyes"?? Uniquely Created!! "Controlling What I Say" - Really? Take A Look and "Rejoice" Some Past Things Are "Worth Seeing"
November 30, 2015 Issue....Fast To Become - Your "Favorite Song"
Faith - Alive and Well!!! God Bless America - "Again"
The "Small Stuff" - Worrying? Really?? How Strong is a Question? How do I Live The Christian Life - Want Help? "A Life Of Blessings; If ----"
Faith - Alive and Well!! The Power of the Right "Song"
I Want To Worship God - But - Where? What? How? Is God interested in your success? Never Lonely - Never Forsaken, What A Shepherd!!! What Does Your Face "Say"? The will of God - can I be sure? Yes!!! Me? In God's Thoughts?? Amazing!! Fast To Become - Your "Favorite Song"
When I'm Weak - I'm Strong?? How Does That Work? God works in the "night"
Problems and Trials are for my Good!! Really?? Wait on the Lord - Why? Thank God for Trials? Really? JOY the real "ENERGY DRINK"
A Sinner - YES! - but - GOD!!! Trouble, Caught In The Middle?? ME?? Living in a Foreign Country? God is Able, The foundation of all Christian life and service. "THINK BEFORE I SPEAK" ME?? .JOY THE REAL "ENERGY DRINK"
HARD TIMES? OR SHOWERS OF BLESSINGS? August 26, 2013 Issue....NEED A FRIEND? NOW? FORGIVENESS WHAT'S THE BIG DEAL? SOMEONE PLEASE -- TURN ON THE LIGHTS OR WHERE'S THE LIGHT SWITCH? DON'T EVER - EVER - EVER - EVER QUIT! WHAT DO YOU SEE?? PROBLEMS OR SOLUTIONS?